This book - The Kings Adventure - features both Kings Journey puzzles, also known as hidoku, AND Knights Tour - so there are two puzzle types to enjoy in this collection. Kings Journey puzzles (hidoku) are easy to play but an absorbing logical challenge nonetheless: simply deduce the path of a chess king as it moves around the board one square at a time visiting every square exactly once. Some squares are given to help you out and you must re-construct the route. A king can move one square at a way in any direction, including diagonally. There is only one solution to each puzzle and that solution can be reached through logic alone. 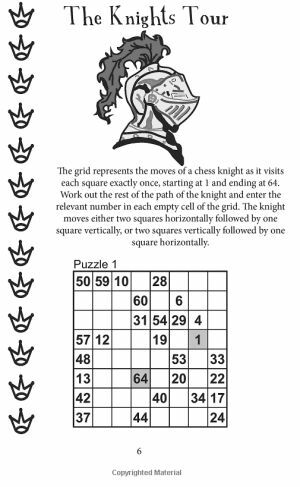 The book also contains 50 Knights Tour puzzles. With this puzzle the rules are the same but it is the movement of a knight around the board that you must reconstruct the journey of as it traverses the grid. Note that the knight in chess can move as follows: two squares horizontally followed by one vertically in any direction, or two vertically followed by one horizontally in any direction, and can 'jump' over other squares in order to do so. If you are a fan of logic puzzles but are looking for something new, then we hope that this fun collection of puzzles will be for you. 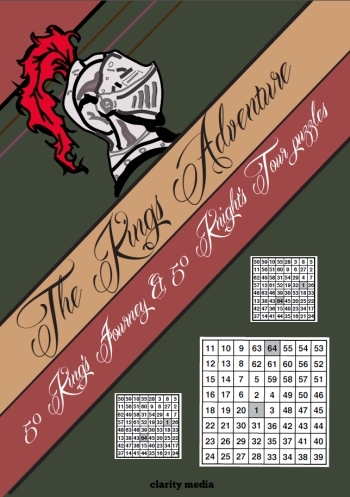 There are the solutions to the 50 kings journey (hidoku) puzzles at the back and also the solutions to the 50 knights tour puzzles at the back, so if you get stuck you can always get help when needed, or of course simply check your solution upon finishing a puzzle. The main tip is that you don't need to solve the puzzles in order, starting at 1 and working through to 64, or the final number in the particular grid size. Instead first scan through in order looking for easy placements - where there is only one option. Typically there will be a few places in the starting grid where only one number can go in a certain square. Another good tip is to look at the corners and edges, because possible moves are more restricted here in kings journey it is often a productive area of the puzzle grid to look at. Sometimes there is only one move available, and of course in which case it can be written in straight away. The puzzles solve quite interactively, so you will find that making progress in one area often helps with another, perhaps by reducing options or removing a potential number you had as an option for another square. Remember that some routes will stop an area of the puzzle from being accessible later in the solve, and so those routes can be removed as an option: perhaps placing a couple of numbers will block off a corner square from being reached later in the solve for instance - look out for this sort of thing and dead ends occurring during solving to reduce options when solving. Finally, sometimes you will find that you know a square must contain one of only two numbers: in this case you can write them in the square as pencilmarks so that you know nothing else can go there. At other times you will know that two squares must each contain one of the same two numbers: where you hit this situation, you now know that those two numbers cannot appear anywhere else in the grid, and so can be removed as options elsewhere: this often helps you make progress too. You shouldn't need rules any harder than these to solve the hidoku puzzles in this book, and remember that there is a single solution to each puzzle and you never need to guess.